Posted February 8th, 2019 by Mobile Music School & filed under Benefits of Music Education. Welcome to our new music education series – Music and Mindfulness! Here at the Mobile Music School, not only do we develop children’s musical ability through fun, interactive music programmes; we also offer students a calm and relaxing break from their busy school week through one-on-one after-school music lessons. In this series we will talk to our talented guitar tutor Zoe who tell us her secret to unlocking music and mindfulness in students. Since we began delivering after-school music programmes in 2011, we have found that there are so many other benefits to music education than just becoming proficient on a musical instrument. Our students use their fun-filled music lessons as a form of escapism during their busy week at school. Winding down after an academic day is important to relax the mind and body, and to prepare for another day of learning. Music education acts as the perfect de-stressor as it encourages mindfulness while also teaching discipline in an enjoyable way. 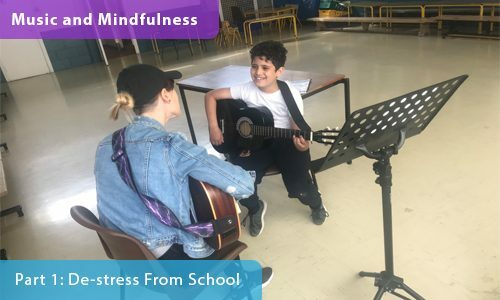 Music and Mindfulness – Part 2: Child-centred Music Programmes coming next week!